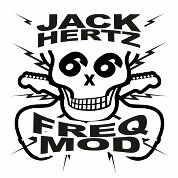 Jack Hertz has been playing, composing and recording experimental music for more than thirty years. Despite being a multi-instrumentalist, Jack is particularly interested in digital synthesizers, especially FM synthesis. He finds all aspects of creating sound to be fascinating, from early percussion instruments to the present day hardware and software innovations. Generally, Jack tries to create a sonic middle ground between the real and the artificial, utilizing synthesizers and digital effects almost exclusively. He likes to design his own instruments and effects with unique characteristics that create spaces and atmospheres for the listener to explore. His first experiments with sound were in the early 1980s with analog reel tape machines, microphones, percussion and a Casio VL-Tone. His first true synthesizer was the Alpha Syntauri digital synthesizer that was was hosted inside an Apple IIe computer. The learning curve was steep, but it provided a plethora of functions most keyboards on the market would not have for nearly a decade. Soon after that came Yamaha's DX7, introducing the FM synthesis that Jack has been working with ever since. Jack focuses on innovation, as he feels electronic music "was meant to do". Today, he is working to build on all aspects of electronic music with the intention of creating new and amalgamated sounds. Taking cues from classic electronic and popular music, his approach is basic, yet robust: to perform on vintage hardware that is processed and controlled with contemporary technology. Jack feels that, as an artist, this allows him the tactile interaction he needs as a performer, but with the kind of the control he wants as a sound designer. Earth Mantra is very happy to bring the music of Jack Hertz to our audience, and we hope to hear much more from him in the future.